We thought we would try and help answer these questions. 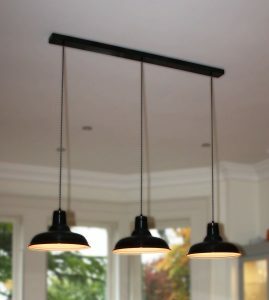 Pendant lighting in kitchens has become more and more favoured in recent years. Having a focal point in a room gives a sense of balance as well as drama, plus it is a great opportunity to express your style and get creative. 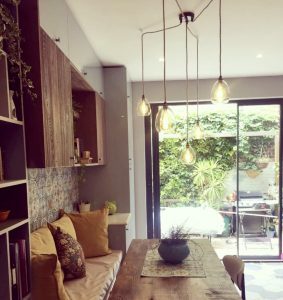 Firstly it is important to consider other aspects of lighting you have in the room, for example: downlights, under cabinet lights, interior cabinet lights, wall lights and table lamps to help understand how much light you need to achieve from your pendant lights. 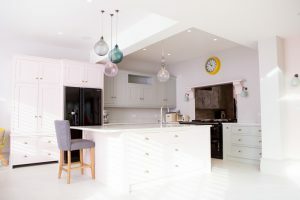 If your pendant lights are the main source of lighting in your kitchen you will need bright light to be used for task lighting. 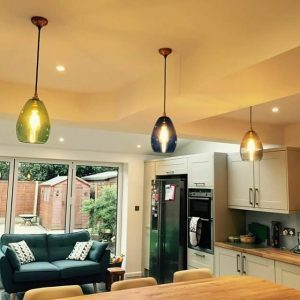 There are lots of different options of light bulbs available, as much as we love layering warm soft lighting, in your kitchen lighting needs to be practical. Cooler or daylight bulbs are the best type of light to see by. Downlights are a great way to spread the light evenly throughout your kitchen enabling food prep etc. Also contemplate the natural light in the room, do you have lots of natural light flooding into the room? If you have lots of direct light pouring into the room you may want to use lightweight window dressings to diffuse the light entering the room and block any harsh sunlight. 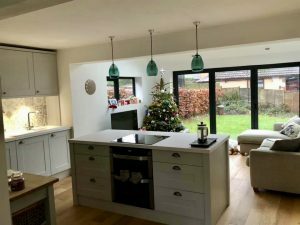 In contrast to this, a lack of natural light will benefit from tips such as using mirrors specifically hung opposite windows to help the natural light bounce around the room, enhancing the natural light you do have. Even simply trimming foliage from around the windows will enhance the light coming in. Although being realistic, and living in the cold grey climes of Great Britain with long dark evenings it is vital to get the lighting right. Thinking about the scale and amount of light required is the most important detail before choosing your lighting. 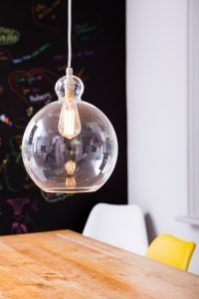 View your pendant lights as an accessory to embellish your kitchen and give it a finishing touch. 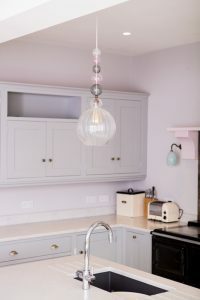 The style and finish of your kitchen pendant lights is down to personal taste but be sure to think about the style of your kitchen and how to compliment the other areas of your space. Don’t be afraid to be bold, big pendants can look fabulous, even over a small island. Interior designers think in odd numbers, for some reason objects arranged in odd numbers appear more appealing and distinctive to the eye. However it is essential to determine the scale and amount of light required when considering this, you don’t have to stick to this rule. 30-36 inches (75-90cm) above your worktop surface. 12-18 inches (30-45cm) in from the edge of your island. This is a very rough guide but hopefully helps as a starting point when commencing your search for the perfect lighting. In our next blog I will talk about textures, finishes and styles of lighting.